Notre Dame d’Haiti Catholic Church: One of the most important institutions in LIttle Haiti that lends support, education, health care services, and a joyful spiritual life is Notre Dame d’Haiti Catholic Church. 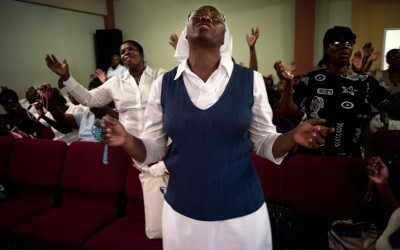 Religion has always been the mainstay of Haitian lives. Masses are held in Creole and English on a Sunday morning. Young and old gather for 4 masses on Sundays, to take communion, greet each other, visit, and cement the idea of a Haitian community in a new land. The young priest who heads the church is Father Reginald Jean Mary (shown touring the new chuch under construction and blessing a young baby in the courtyard after mass). Sunday, Feb. 17, 2013, was the beginning of a 7-day revival in which Haitians openly worship emotionally inside the church while others visit in chairs set beneath the giant oak trees on the church grounds. The church should be finished by May and will hold many hundreds more people. 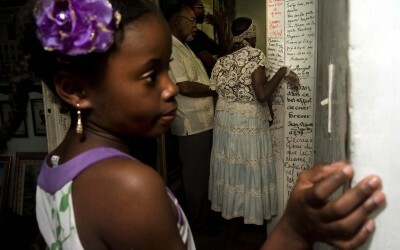 A fundraising effort and drive has proven successful among the Haitian community but more money is still needed. Father Reginald takes two visitors on a tour of the new church under construction. A shopper pauses outside Adolphe’s grocery store, set on a back street in Little Haiti, a poor man’s version of Costco, where goods can be bought in large quantities (oil, bags of rice, beans, etc.). Haitians live off these provisions in Little Haiti but they also often buy the big bags of food and ship it home to their families in Haiti, along with money. This diaspora community retains ties to Haiti, both culturally and physically, through the support of their families, often destitute, back home. Outside Adolphe’s store, February 9, 2013, Haitian market ladies set up their vendor stands as in Haiti, selling food, fresh vegetables, herbs for medicinal teas, clothes, soaps—you name it. Even this little bit of money helps them eke out a living in Miami but is also reminiscent of home. Little Haiti in Miami, Florida. Rara Selects: Rara is a street party and also describes little bands of musicians who wind their way through streets and the countryside in Haiti gathering people into a group as they go just for the celebration of life, music, happiness, entertainment. In Haiti they are spontaneous and occur frequently during carnival time. 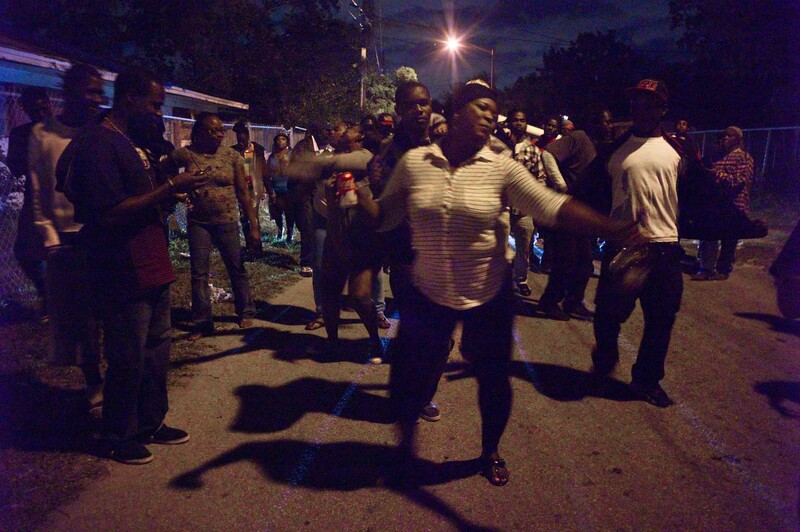 But in Little Haiti, for the past 8 years, a rara band of musicians convenes every Friday night at 9pm on a particular corner to play their instruments, designed just like some AFrican instruments, around the neighborhood. 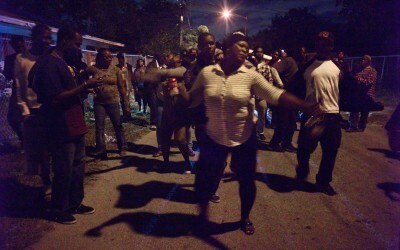 People gather little by little or join as Haitians dance and sing their way through the streets of LIttle Haiti. This is a very Haitian custom and non-Haitians are welcomed without hesitation. It’s joyful and is a release from the challenges of making a new life in America and a remembrance of home. 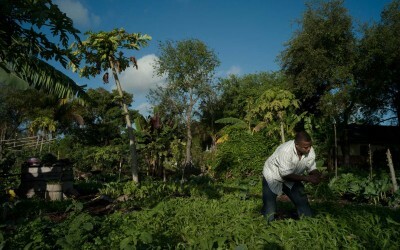 Prevenir Julien and the Little Haiti community garden: Prevenir Julien and his son Belix, 12, came to Miami after the 2010 earthquake because of a head injury his son suffered when another boy struck him in the head with a pick axe. Medi-share, affiliated with the Univ. of Miami, brought Prevenir and son Belix to Miami to save his life. After series of operations, Belix a helmet for almost a year to protect his skull and brain after a plastic piece was used to replace the part of the skull destroyed by the accident. 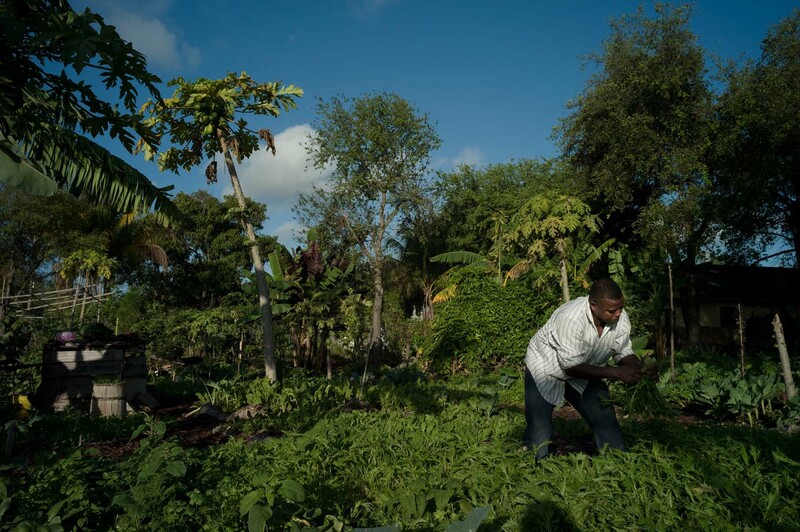 Prevenir was given a job in the community garden of Little Haiti, a project of a local non–profit organization, which pays his salary. His son and he were placed in a new modern, if small apartment, much different than their home in La Ravine, Haiti. Prevenir’s wife abandoned him and the other children, still living with their aunt in Haiti, but he’s happy to be here, and with the efforts of other Haitians, is making a new life for his son and himself—a successful immigration story. Pix show Prevenir and his boy working in the garden, at home when father is trying to get his son to take a nap in their one-bedroom apartment; Belix outside playing with his cell phone. 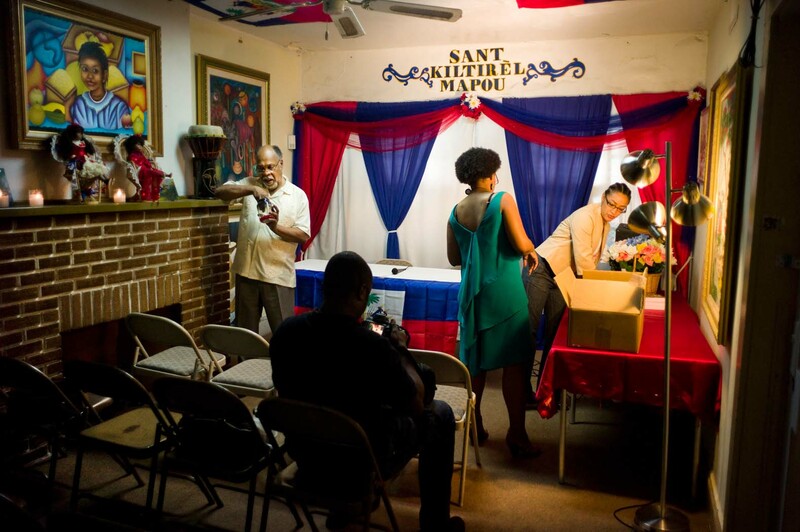 Jean Mapou is considered a poteau mitan—an important person in the Haitian community. His bookstore on the main street sells books in Creole, French and English and includes Haitian authors. 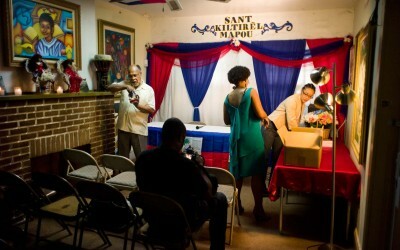 But he also hosts many cultural events in his upstairs Haitian cultural museum and tiny auditorium. One recent evening (Jan. 27, 2013) he hosted a reading by young Haitian women authors who had short stories published in an anthology, extremely well attended by locals, who listened, chatted, and visited. Among them were 2 little girls whose mother and father are in the publishing business and host a number of cultural events at Mapou’s store. Mapou also goes on Haitian radio from time to time to speak about the Creole language in effort to get young people to learn and speak it and he gives lessons—he is a very important figure in keeping Haitian culture vital and alive in a new land where Haitians are trying to re-create their homeland. Mr. Mapou outside his store on a lazy afternoon in Little Haiti. Girls fold laundry as Haitian painter Serges Toussaint leads a tour in the heart of LIttle Haiti (in MIami, FL.) to show people the murals he has painted around the area, including in a laundromat, on walls around the area, etc. 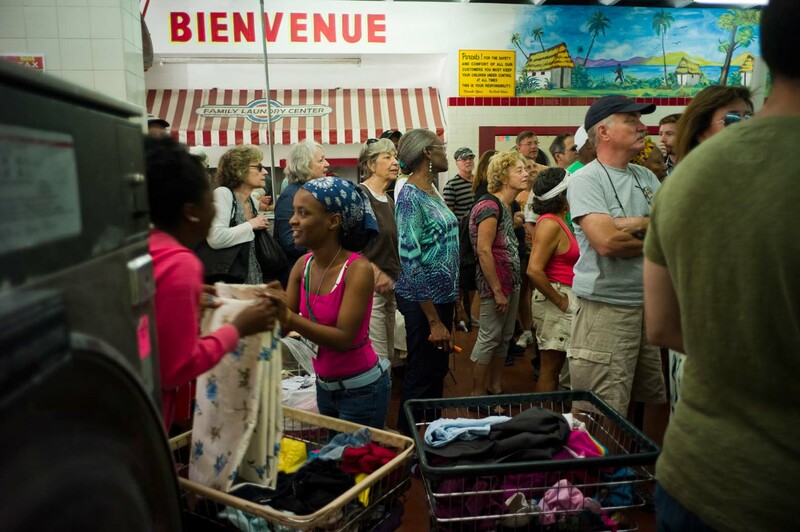 The tour was sponsored by the historical society and brought dozens of people who might not otherwise come to Little Haiti. The community, in the late 1980s especially, had the reputation for being dangerous after so many former secret police under the Duvalier regime fled to Miami when the 30-year-dictatorship fell. 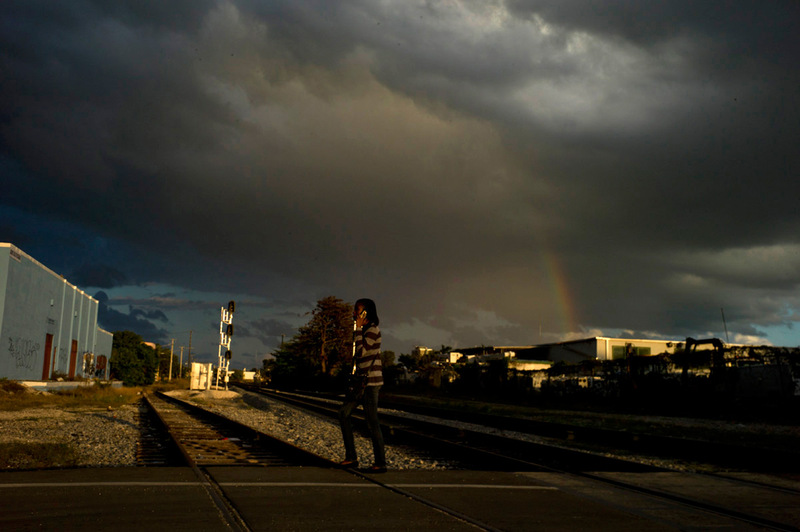 Now LIttle Haiti is trying to become a destination. The black man leading the tour is Serges. 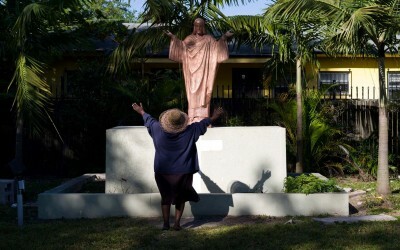 A woman prays to a statue of Jesus out in the yard of Notre Dame d’Haiti in Miami’s Little Haiti neighborhood on a sunny morning on January 3, 2013, a few days after the New Year. Members of the Catholic church, where masses are given in the Creole language, come often to spend time in the large yard and pray. 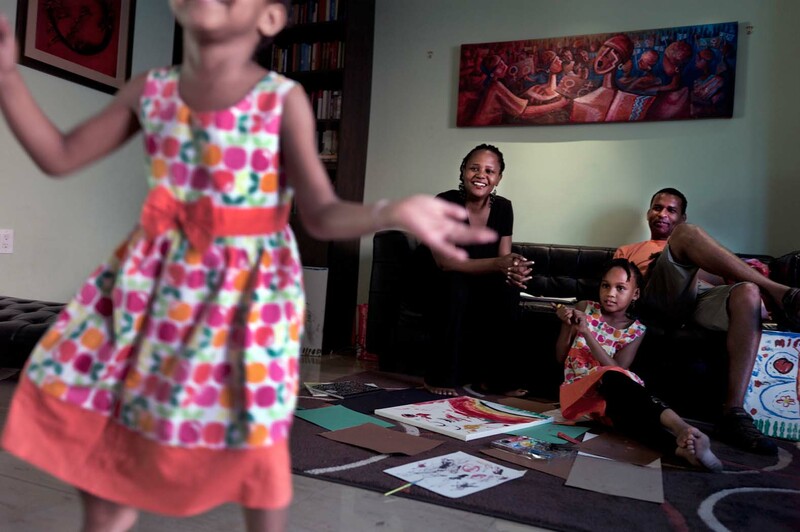 Edwidge Danticat, an internationally renown Haitian writer, lives with her family in Little Haiti in Miami. Born in Pt-au-Prince, Haiti, she moved to Brooklyn, N.Y. at the age of 12 and finally to Miami. Her writing awards are too numerous to list but include the Langston Hughes Medal, the MacArthur Fellows Program, the American Book Award and others. She has written 14 books including essay contributions to books. She is very involved in Haitian cultural issues locally and abroad. She is married to Faidherbe (called Fedo) Boyer and has two daughters, Mira Danticat Boyer, 8, and Leila Danticat Boyer, 4. At home working on her latest manuscript, Edwidge spends time with her husband and the girls. As they paint, she edits her upcoming book. Leila, foreground in some photos, distracts her as she dances for the family. Later outside the family takes a break to get the last rays of the sun. Portraits of Edwidge Danticat. Lead by FANM executive director Marleine Bastien, Haitians gather at Notre Dame d’Haiti Catholic Church in NE Miami to board buses taking them a rally and march in support of immigration reform. The group was joined by other immigrant groups to swell the crowd to thousands. 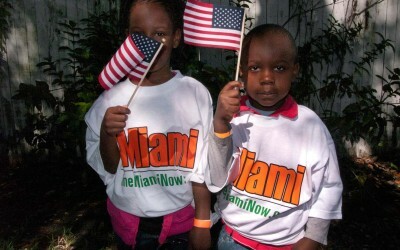 They rallied in Jose Marti Park in downtown Miami and then marched to Bayside by the bay where another rally and mock citizenship ceremony was held for everyone to take an oath. Everyone from an older gentlemen to youngsters joined in carrying signs and marching the long route. Photos show Haitians boarding buses, singing and waving flags on the bus, at the rally marching around the park with signs, marching the route with other immigrant groups and during the final rally at Bayside. 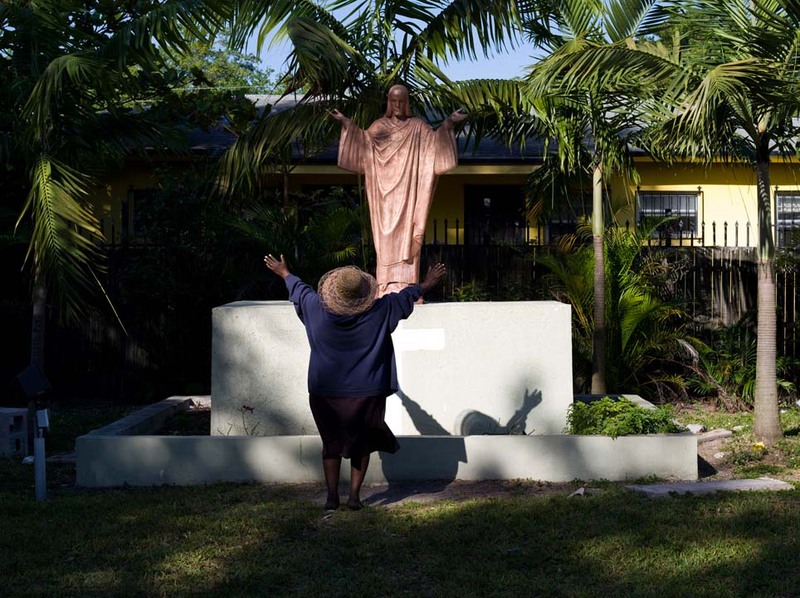 Little Haiti in Miami, Florida is part of North America’s immigrant narrative. 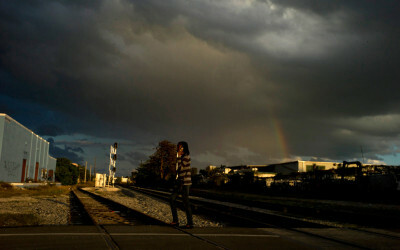 A cultural mecca for decades, Haitian refugees fleeing everything from a dictator’s secret police and political violence to natural disasters have flocked to Miami, the most immigrant city in America. 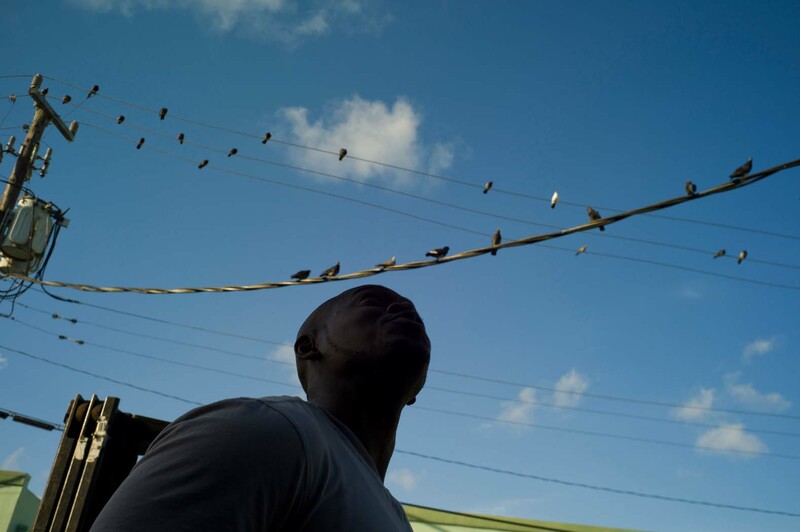 In two square kilometers, Little Haiti boasts the largest concentration of Haitians outside the Caribbean country. 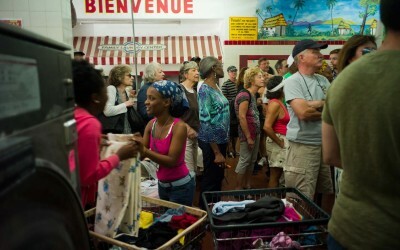 More than 30,000 Haitians reside and work there. Creole is the lingua franca, vodou is practiced, art flourishes and locals dance to the latest tunes from Port-au-Prince. Like so many others in South Florida, Haitians have lost jobs or had their hours cut back, reducing their income and ability to help their families back in their home country. Some have lost their homes. 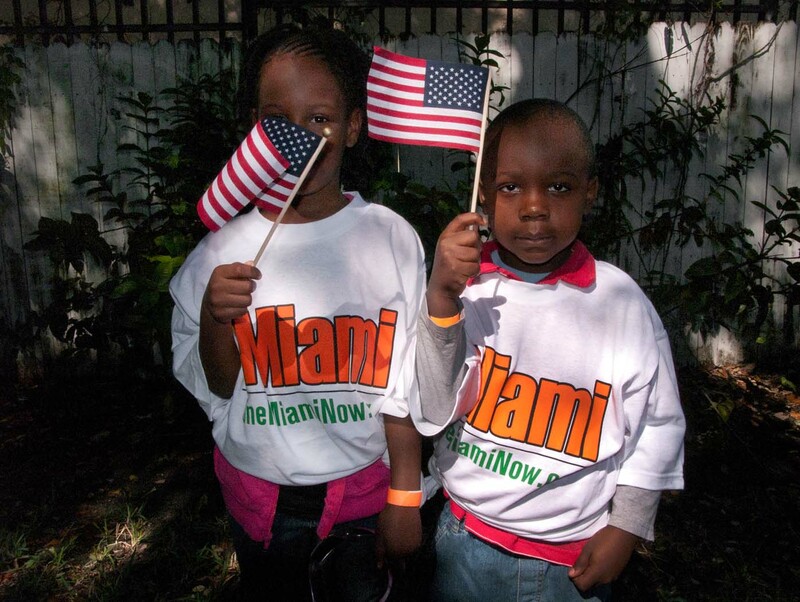 The aim of the project is to show how the Haitian immigrant community, separated by language and culture, works to lay the groundwork for new arrivals hoping to establish new lives in the United States. It examines an immigrant community that is largely self-sufficient due to the efforts of the diaspora and in turn examines the immigrant experience for all immigrants through the eyes of those who have escaped from political and economic turmoil. These immigrants make our own country richer. Through their activism, small successes and the import of new ideas, diaspora communities make the United States, a nation of immigrants for generations, a better place. 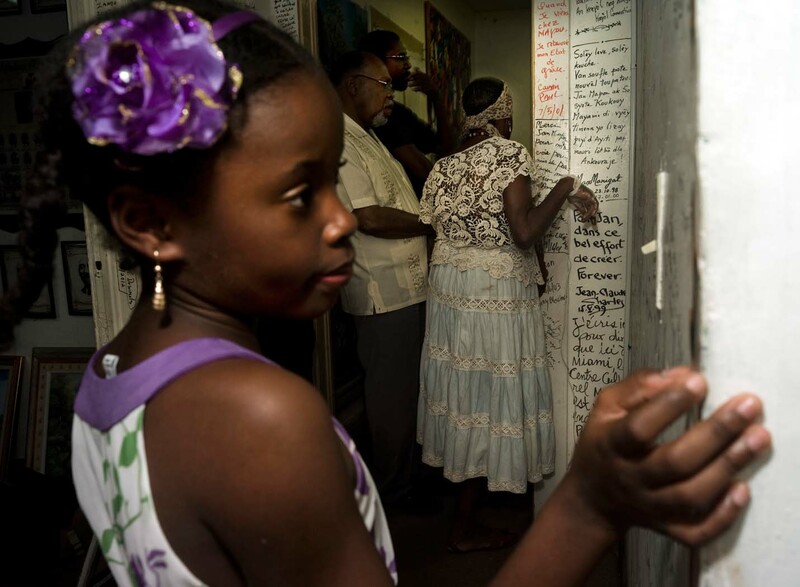 Haitians helping Haitians in Little Haiti offers a look at how a beleaguered people builds a new community and a second chance at life.